Today we are going to share some simple yet useful money hacks to help you save the most when shopping online. Shopping from a website is not only convenient but pocket-friendly. You save on time and efforts that you would have to spend at physical stores. You can browse the shopping sites from anywhere and from any device, like laptop, tablet, smartphone etc. Also, you get to check out great selection of products and services at one place. Online shopping has gained a quick pace past a few years, and more and more people are choosing it over purchasing from brick and mortar stores. Some online shopping sites provide discount for first time purchase, but only if you register as a member. Do not miss such offer. If you are already a member, sign up from another email id you have and earn the reward. If you are ordering for the first time, but as a guest, then you may not be eligible for this offer. Are you eager to buy that new sound system or smartphone? Pre-order the product at online shopping site and get better discounts. There is generally a tab for the maximum members who can pre-order at a time, so hurry, before you miss your turn. Apply for personal loan today to fund your personal expenses and online shopping! Most of the popular shopping sites such as Amazon, Flipkart, Snapdeal etc have developed applications compatible with different operating systems and devices. Today, everyone has access to smartphones, thus it is evident that online sites try to attract the customers with smartphones to their websites. Such sites offer additional discounts for those purchasing through applications than those purchasing from the website. At times, online shopping sites offer cashback and rewards or discounts, if you pay for the goods or services via a certain bank, debit card, credit card, or payment wallets. Use the mentioned mode of payment on which the discount is eligible and save huge on the purchase. When you are going through a product catalogue, there are several filters you can select to narrow down your search results. Selecting specific filters will help you find the product you want, faster. You can even select filters related to discounts. For example, on selecting the filter “40% to 70%” discount, you will be shown products on which this condition applies. Do you have old gadgets like washing machines, kitchen appliances, televisions etc? You can replace the item with a new one, but at a lesser cost. Take benefit of the exchange offers online and exchange the old product you have with the new. Pickup of the product is taken care of by the delivery personnel. There are several credit cards specially suited for shopaholics. If you buy goods and services from online websites often, then you can enquire about best credit cards for shopping online and get one for yourself. You will earn rewards and purchase points on such credit cards and even discounts, which will not be available otherwise to regular customers. Who likes their email inbox being filled with irrelevant emails? However, if you shop online, you may want to read the promotional emails from shopping sites than deleting those straightaway. These emails sometimes contain special offers and discounts, which can be only availed if you follow the instructions mentioned in the email. So next time you spot an email from a shopping site, give it a look. Generally, shopping sites provide free shipping above purchase of Rs. 500. Paid shipping can extend the bill amount by a few hundreds of rupees. The amount in question may differ from one site to another. Thus, if you intend to purchase something, then buy the items together, so that the bill amount exceeds the limit set for free shipping. The shopping website may offer you free coupons of a certain amount to shop from another shopping site. This is a fair tactic adopted by many businesses. For example, ‘A’ is a shopping site for baby products, and ‘B’ is a site for movie tickets. Now ‘A ‘may offer you Rs. 200 free coupon to buy from ‘B’, if your purchase from ‘A’ is above Rs. 1000. Certain shopping websites ask for an annual fee of few hundred rupees. The paid membership enables you to earn advantages like free shipping (irrespective of the bill amount), great discounts over products, better cashback offers, faster delivery etc. A good example of it is Amazon Prime membership. If you are a frequent shopper of online products, then subscribing for such memberships can help you save more than you would save from your free membership account. Many online sites allow you to become an affiliate and provide links to their goods and services to someone else. When that person buys a product or service using this link, you earn a commission. You can however, personally, not buy products or services using the same link. Like loanbaba.com helps you to compare, choose, and apply for loans by providing you a detailed look into offers and schemes by several banks and NBFCs, there are certain websites that do something similar. They let you compare price of products over popular online shopping sites at one page. Thus, you can purchase the good from the site that quotes the best price without having to do much research yourself. Apply for a small cash loan for instant cash up to Rs. 50,000 for shopping online! Online shopping sites have a system of allowing customers to purchase gift cards, which usually have validity of a year. Sometimes, people receive a gift card as a gift and may not intend to use it. They can sell the gift card to others on certain sites. You can check out these sites and probably buy the gift card at a lower amount than what it amounts to. So, you have purchased a product, but you notice that the price of good has dropped from the time you purchased it. What do you do? You could either be happy with the purchase or return the product before it reaches you. The product amount will be refunded back to you, and you can still shop the product at the current (lesser) amount than you had purchased it for. You may have noticed that certain items are available in more than one colour, especially smartphones, laptops, clothes, headphones etc. If you are not too strict about the colour of the product, you can pick a less popular colour for the item, and save good amount of money. Popular colour products cost more at least by a margin of up to 10%. 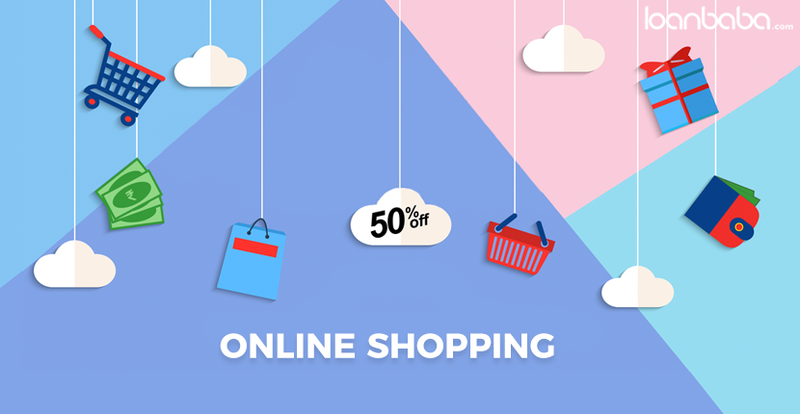 To entice customers, almost all shopping website launch interesting offers and discounts on products during big festivals such as Holi, Diwali, Ganesh Chaturthi, Christmas etc and special days such as New Year, Republic Day, Valentine’s Day, Independence Day, Mother’s Day, etc. The discount offered is sometimes up to 70% to 80%! You can even sell used items on shopping sites. Some websites have the facility of selling upcycled and repurposed items by customers. They may even allow you to sell pre-owned items without any fee. You can register and sell for free and share a certain commission of the bill amount with the site. It is a win-win situation. Referring reviews and deciding to buy an item does not directly save you money but it can save you from losing money on buying an inferior product. You can rather use the money to purchase from a seller that has received good reviews for hassle-free purchase. If you are an expecting mom, you can get a free kid-pack with order on maternity clothes, or if you have been kindle membership, you can get free e-books etc. Thus, whenever shopping online, check for any ongoing schemes that will assist you in getting any product or service free of cost. While shopping, some sites sometimes offer you the choice of donating a few rupees (as less as Rs 2), towards welfare of the economically disadvantaged, and save someone’s life. While you save thousands of rupees by following the above-mentioned tricks, donating a rupees can be the reason of thousands smiles. Become a smart shopper by adhering to the given tips and save big on purchases online! Share with us any other money hack for online shopping that you may be aware about.